This year's Scrapel Hill exhibit opens next week. 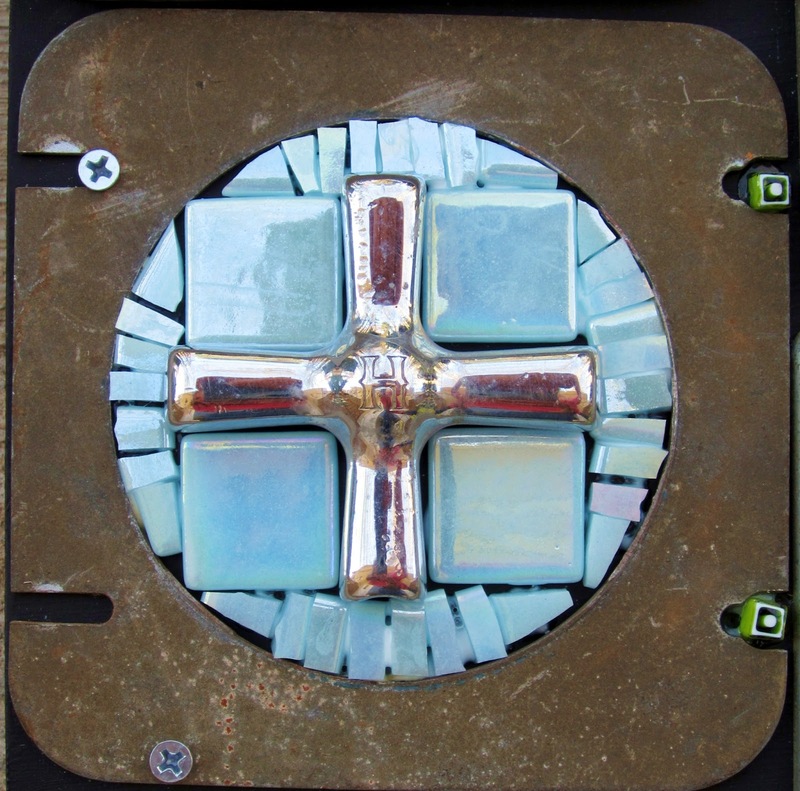 I installed my recycled/scrap/repurposed sculpture today at the University Mall in Chapel Hill. 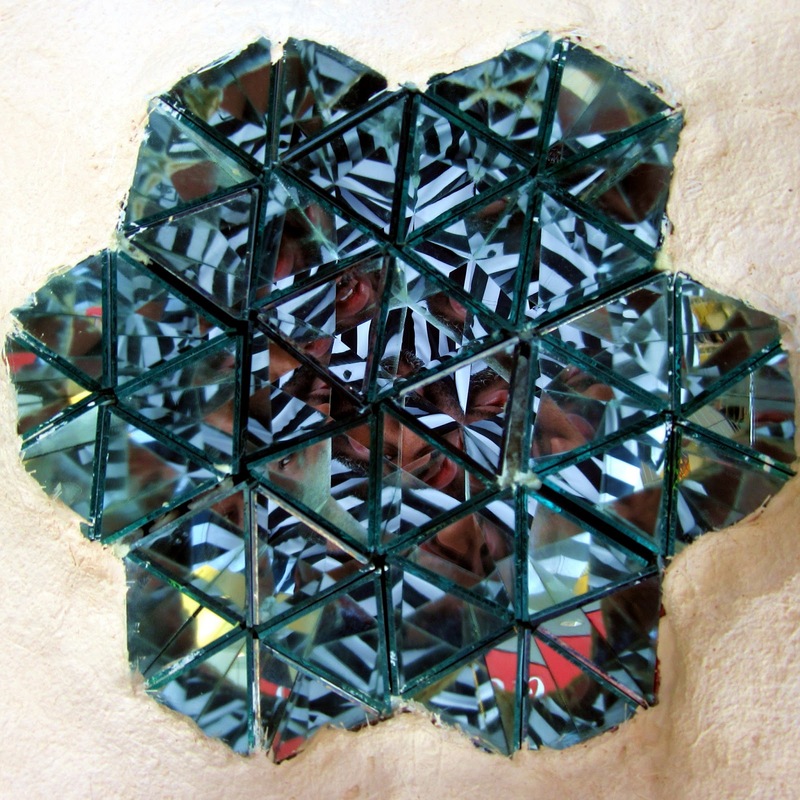 It is titled "Alternate View" and uses scrap and discarded mirror, reconfigured into prisms, to give viewers an opportunity to see unique kaleidoscope/mosaic fractured images through the sculpture. 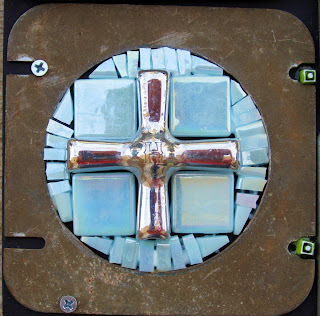 There is a bit of mirror mosaic decoration, but mainly the idea is the deconstruction and reconfiguration of images with each passing glance, changing light, and who or what is on the other side. The first photo is the lower prism complex which is at a child's height, and has 42 prisms each made with three 12x2" mirrors (cut from scrap/discards). You are seeing Frank, the Footlocker employee, who was very supportive of my Flytrap piece last year. His iconic Footlocker stripes looked extra cool in the prisms. 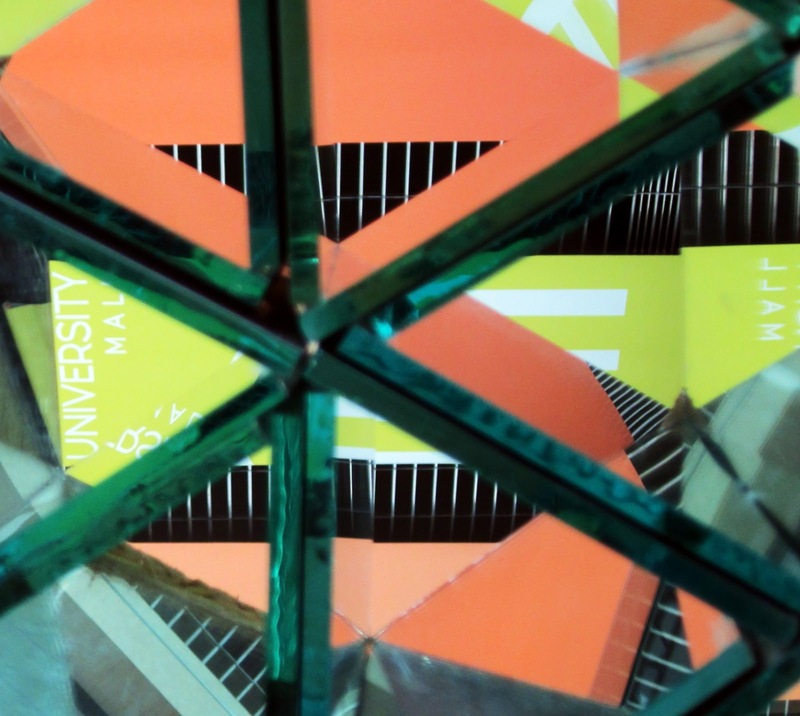 The second photo is looking at the University Mall banner thru the upper prism complex (adult height) with 12 12x3" prisms. The prisms are housed in discarded foam coolers with applied fiberglass and cement to make each piece durable, finished, and suitable for stacking/support of the mirrors. There are pvc sections within each so they can be attached together and to the cafe table base (perfectly good, which my Dad rescued from a dumpster). Last week I took a quick trip to NYC with my 13 yr old son. I told him that he could pick the things he wanted to see/do, with one exception: one art museum for no more than 2 hrs. I decided on Museum of Modern Art (MOMA) since I had been to the Guggenheim, and Metropolitan Museum of Art in previous years. My NYC guidebook suggested going straight to the 5th floor and working down. Just the 5th floor was totally worth it. Each work is recognizable, and many of them are iconic such as "The Scream". This is one of the 4 originals, pastel, that sold last year for an incredible 120 million dollars at auction. 120 MILLION. Who knows how much "Starry Night" would bring???!!! It was there too. Yes, the REAL one. Right there in front of us. It was busy at the museum, but as you can see by my pics, we were up close and personal with these incredible works of art. In fact, I was shocked that photography was allowed at all. This Monet "Water Lilies" version took 12 years to paint. It was huge. There were a ton of Picasso works, this one was bright and bold, and instantly recognizable. They also had the boy with horse, musicians, and several others that anyone would know as a Picasso. This is the only work of Freida Kahlo's they had currently on display, it had a very ornate mirrored frame that was hard to photograph. This Matisse was also very large, and what an impact it had in that space! Each floor of the MOMA had treasures, but eventually Austin was making comments such as, "Mom, isn't that just green paint on cardboard, like the samples you get at Lowes?" I knew my time at MOMA was up. Such a sweet boy, he did voice his opinion that my "Flytrap" was at least better than that.... sigh.